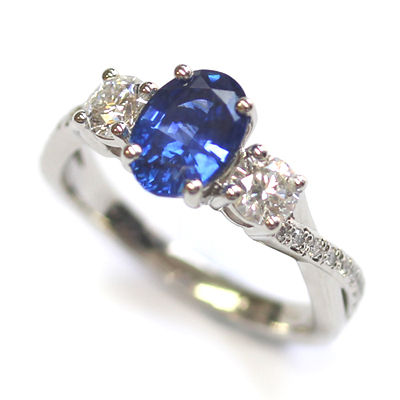 Platinum Blue Sapphire and Diamond Trilogy Engagement Ring — Form Bespoke Jewellers Ltd.
A platinum trilogy engagement ring with a beautiful blue sapphire and diamonds. 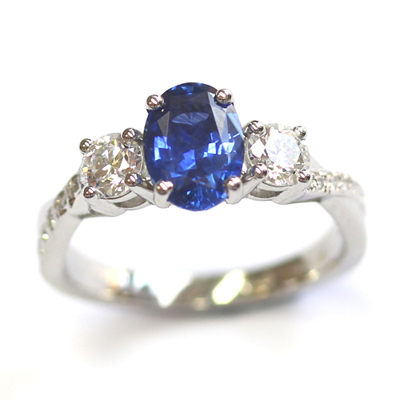 A beautiful oval cut, blue sapphire sits at the heart of this trilogy engagement ring. Hand-picked by the customer, it has been hand set into a neat four claw setting. Two round brilliant cut diamonds flank the sapphire. They are of matching colour and clarity and are also hand-set in four claw settings. This provides beautiful symmetry across the trilogy. The shoulders of this ring have also been carefully considered. With an elegant twisting design, they too have been diamond for an extra delicate sparkle.